Net Entertainment’s sci-fi slot Space Wars is a simple slot without free spins or progressive jackpots. However, its innovative cloned re-spins feature and wild symbol makes it one of the most attractive slots in the NetEnt portfolio. NetEnt’s Space Wars is played just like any other NetEnt slot. Since the 40 paylines are fixed, players have to play them all, placing a minimum bet of $0.40 per game. While this may delight low-stakes players, high-stakes players will be delighted to know that they can bet as much as $200.00 per game. The coin values range from $0.01 to $0.50. Players need to first place their bets and then hit the Spin button. They can claim a payout if a winning combination is displayed on the reels. Otherwise, they can place another bet and try again. Space Wars is one of the most unique outer space themed slots in the NetEnt portfolio. Players who love science fiction themes just cannot afford to miss this slot as it gives them the unique opportunity to visit distant galaxies, interact with aliens, and get involved in their intergalactic wars. During this adventure, players can win plenty of coins and become rich. The color scheme and graphics may appear to be dull and sober initially, but players will hardly notice this when they get wrapped up in the intergalactic adventure. The slot has awesome audio effects, background music, graphics, and animations. Space War slot has wild symbols that appear only on the second and fourth reels during the re-spin feature and the base game. Players can use the wild symbol to hit winning combinations and collect extra payouts. Another exciting feature of Space Wars is its re-spin feature, which gets activated whenever players create a winning combination. All the symbols in the winning combination are then enclosed in a pod and clones of these symbols are placed on a separate set of reels, which are re-spun. 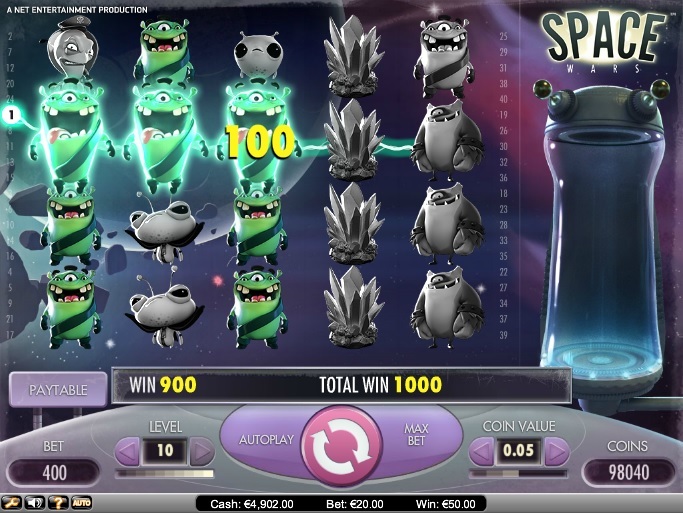 Like all NetEnt slots, Space Wars comes with a Skill Stop feature, which players can use to stop the reels in mid-spin and grab a winning combination. This feature converts a game of chance into a game a skill, making the slot all the more lucrative. As players notice, Space Wars is not overburdened with bonus features. This makes it the best NetEnt slot for those who are just getting started with slots. The top fixed jackpot may be a bit disappointing, but players shouldn’t forget that the slot gives them the opportunity to win as many as 400,000 coins in its re-spins feature, which happens to be one of the most unique features that NetEnt has ever developed. This feature also happens to be easy to trigger. Those interested can play Space Wars for fun or real money at any NetEnt online casino.